The tube dispenser for precise application of silicone compound that facilitates heat transfer between circuit components and heat sinks. This heavy consistency material is thickened with a heat conductive metal oxide filler to maintain a positive heat sink seal in electrical/electronic equipment. 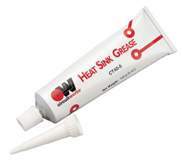 Online Catalog | Chemicals, Cleaners & Wipes | Lubricants & Grease | CircuitWorks CT40-5 Heat Sink Grease, 5 oz.